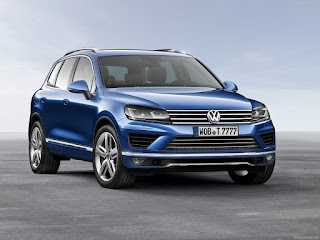 The Volkswagen Touareg (German pronunciation: [ˈtuːaʁɛk]) is a mid-size luxury crossover SUV produced by German automaker Volkswagen since 2002 at the Volkswagen Bratislava Plant. The vehicle was named after the Tuareg people, a Berber-speaking group in North Africa. The Touareg (internally designated Typ 7L) was a joint venture project developed by Volkswagen Group, Audi and Porsche. The goal was to create an off-road vehicle that could handle like a sports car. The team, with over 300 people, was led by Klaus-Gerhard Wolpert, and based in main base Weissach, Germany. The result of the joint project is the Volkswagen Group PL71 platform, shared by the Touareg and Audi Q7, Porsche although there are styling, equipment, and technical differences between those vehicles. 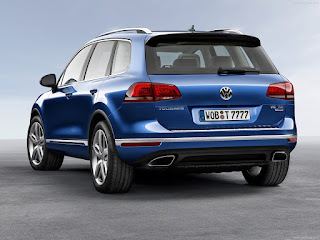 The Touareg both seat five, while the Q7's stretched wheelbase accommodates a third row for seven passengers. The Volkswagen Touareg is built at the Volkswagen Bratislava Plant in Bratislava, Slovakia, alongside the Audi Q7 and Porsche Cayenne. 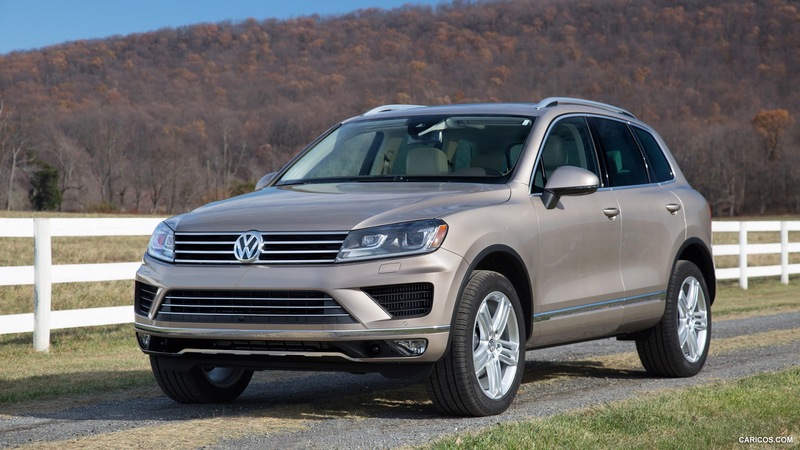 Due to the demand, and the exchange rates of euros against the US dollar, as well as different pricing and environmental policies in the USA, the V6 and V8 engine variants make up most of Volkswagen's American Touareg offering. Compared to other Volkswagen-branded vehicles sold in the USA which are aimed at the mass market, Touaregs came in the more upscale trims and placed in competition with other luxury crossover SUVs from BMW and Mercedes-Benz. However, a limited number of the V10 TDI Turbocharged Direct Injection (TDI) diesel engines were available in the 2004 model year (before being pulled for environmental reasons). They were brought back to the United States for the 2006 as a "Tier I emissions concept (43 state emissions)". 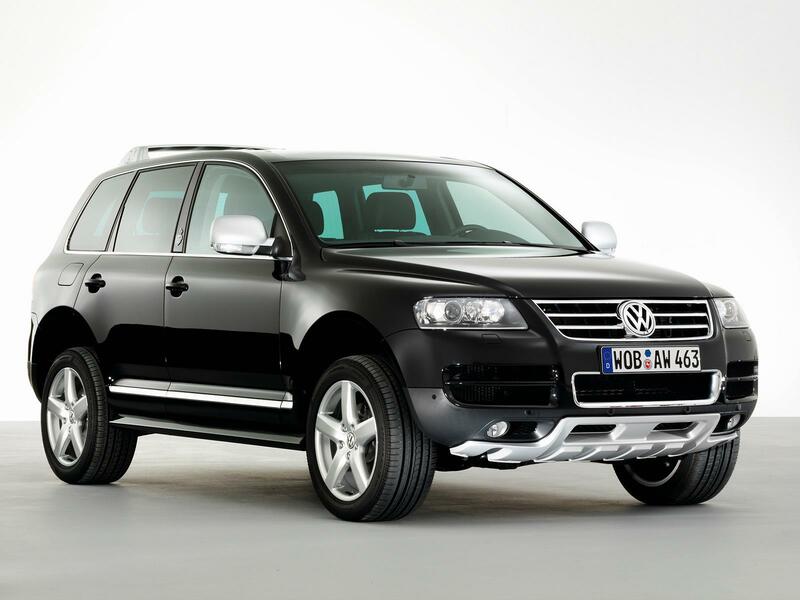 The Touareg comes as standard with a four-wheel drive system. An automatic progressively locking centre differential (with manual override), and a "low range" setting that can be activated with in-cabin controls. Options to make the vehicles more capable off-road include an available 4-wheel Adaptive Air Suspension (plus Continuous Damping Control) which can raise the car's ride height on command, and an interior switch allowing the rear differential to be manually locked. Its load level ground clearance is at 6.3 in (160 mm), Off Road Level is at 9.6 in (244 mm), and Xtra clearance of 11.8 in (300 mm). A 2007 Volkswagen Touareg 2 V10 TDI towed a Boeing 747 airliner in 2006. The Touareg was marketed as being the most capable off-roader to date. 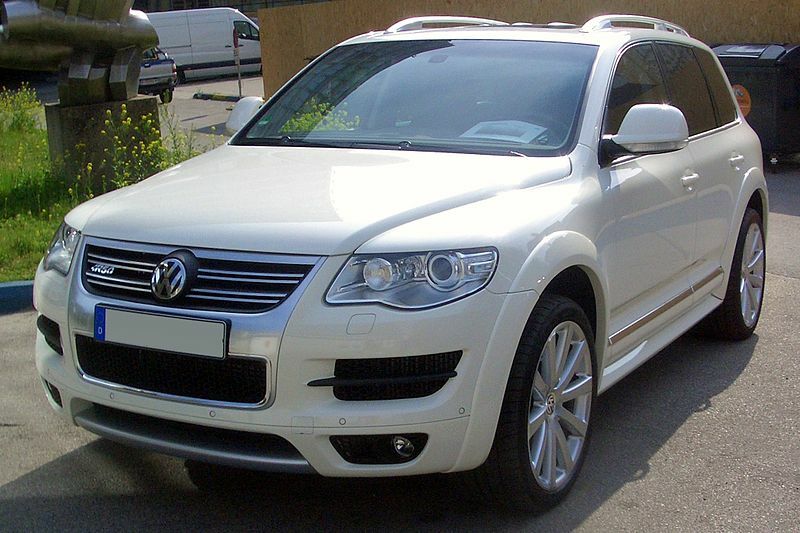 Several 2007 First Generation Touaregs were given to the staff, cast and crew of King Kong. Volkswagen subsequently offered for sale the Touareg Kong special edition, which featured upgraded specification and King Kong badging on the B-pillars. The 6.0-litre double overhead camshaft (DOHC), 48-valve W12 engined version was initially intended to be a limited-edition model, with just 500 units planned to be produced; around 330 were slated for sale in Saudi Arabia, with the remainder sold in Europe. No sales in the United States were made. Eventually, the W12 model became an ordinary model without any production restrictions. It is estimated to reach 100 kilometres per hour (62.1 mph) in 5.9 seconds. The V10 TDI was offered in the United States for a limited time in 2004, but emissions regulations forced it off the market for a temporary period. The V10 TDI returned to the U.S. market as 2006 model year vehicle in five states. Later US models went on sale in 2006, which was compliant with 50 states emission with Ultra-low sulfur diesel and particulate filter. Stricter California Air Resources Board (CARB) emissions standards resulted in the V10 TDI being cancelled again in the United States. The V10 engine has since been replaced by a V6 TDI engine that meets the CARB minimum emission requirements for the 2009 model year. Side Scan, a blind-spot monitor : it uses radar at the rear of the car to sense another car's presence, and causes light-emitting diodes (LEDs) built into the wing mirrors to flash. If the driver indicates to move out, the LEDs flash at an accelerated rate to warn the driver until the other vehicle moves out of the Touareg's field of vision. The 2007 Touareg, alongside an already lengthy options list, could be equipped with a driving dynamics package, a rollover sensor, a 620 watt Dynaudio sound system, and redesigned comfort seats. All diesel versions now have the diesel particulate filter standard. 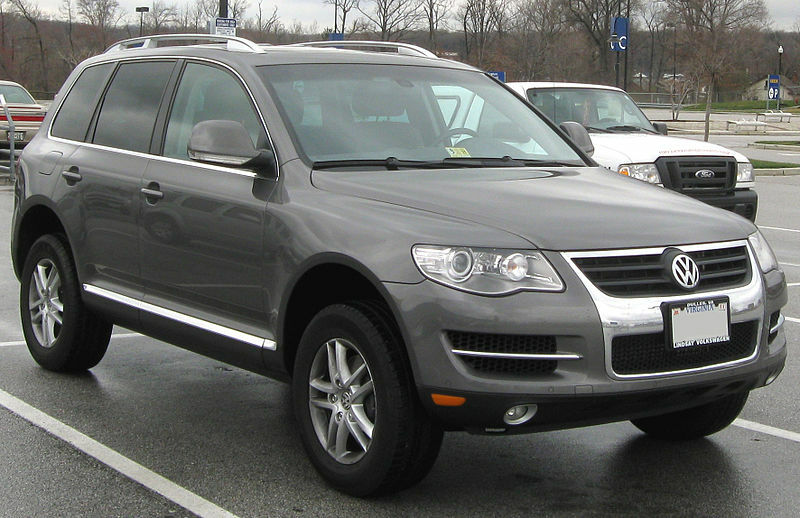 In the US and Canada, the facelifted Touareg was marketed as the Touareg 2 for the 2008-2010 model year, reverting to simply Touareg in 2011. The Touareg R50 is the third Volkswagen after the Golf and Passat to be given the 'R' treatment by Volkswagen Individual GmbH. The R50 global launch was at the 2007 Australian International Motor Show. The "R50" naming comes from the engine displacement: 5.0 L. The R50 was offered with a 5.0-litre V10 diesel engine, 257 kilowatts (349 PS; 345 bhp) with 850 newton metres (627 lbft) of torque, and pushing the car to 100 kilometres per hour (62.1 mph) in 6.7 seconds. The R50 came standard with 21-inch Omanyt wheels, sport-tuned air suspension, decorative 'engine spin' finish interior trim inlays, and a four-zone Climatronic climate control system. It is a version of V6 TDI with improved performance. The 2007 version of the V6 TDI has now 239 PS. With this engine, the car reaches 100 km/h in 8.3 seconds. Also, this improved version of the V6 TDI develops 500 N/m. It is a version of V6 TDI with Selective Catalytic Reduction (SCR) system, replacing V10 TDI in US and Canada. The Touareg contains a 4.5 US gallons (17 l; 3.7 imp gal) tank in the rear of the vehicle underneath the spare tyre which stores the AdBlue solution. It is estimated that this tank will need to be replenished every 6,000–10,000 miles (9,700–16,100 km). 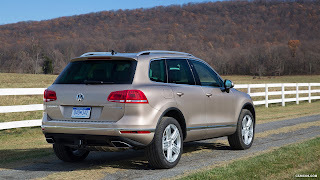 The Touareg does not include NOX storage catalyst found in Jetta Clean Diesel TDI due to its heavy weight. 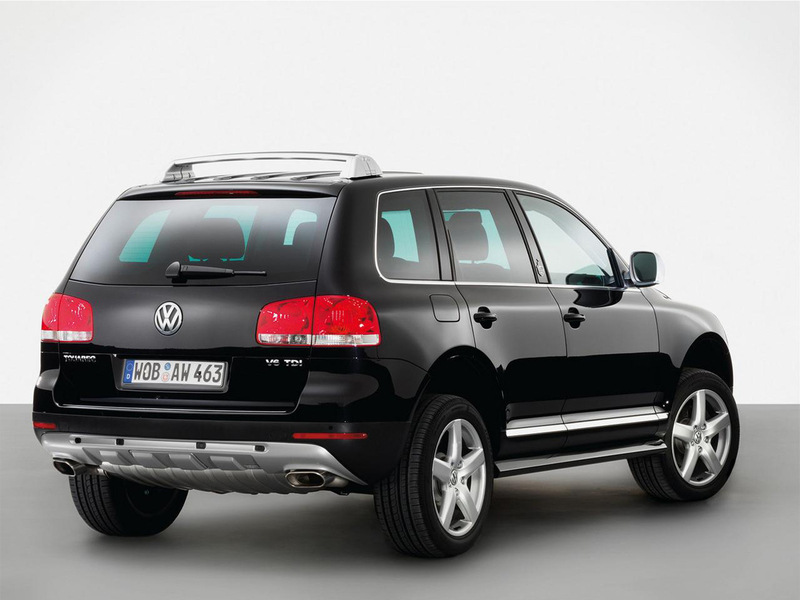 Touareg BlueTDI was unveiled in 2007 Geneva Motor Show. Production version of V6 TDI Clean Diesel was unveiled in 2008 LA Auto Show. Although sales of production version was planned in North America in 2008, it did not start until 2009. Sander Kuiken, Technical development diesel application, Volkswagen AG was one of the engineers that worked on the AdBlue system created by Volkswagen, BMW, and Mercedes-Benz. 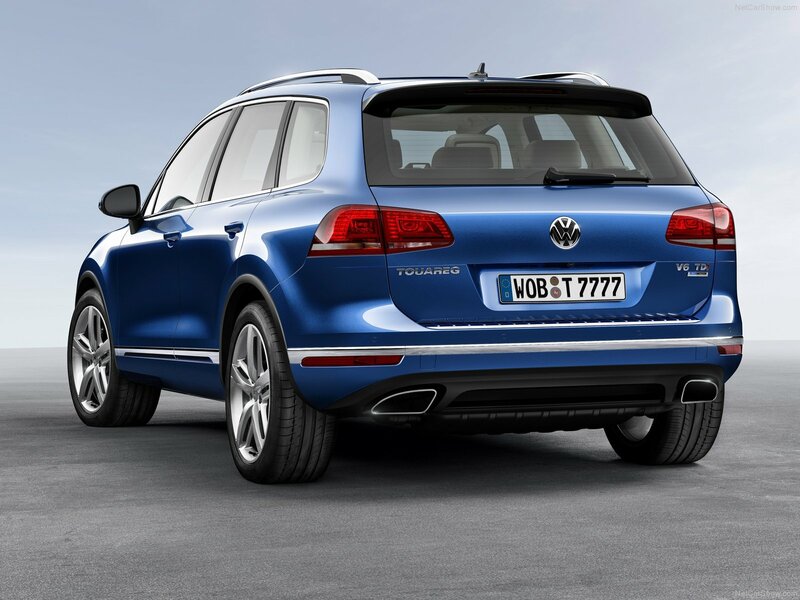 Kuiken talked about the difference between the VW Touareg diesel and gasoline vehicles. It is a version of V6 TDI Clean Diesel (225PS), V6 FSI, V8 FSI for the US market, with 20-inch alloy wheels ("Mountain" type) with size 275 all-season tires, a choice of 4 body colours (Biscay Blue, Black Magic Pearl, Campanella White and Galapagos Gray). It came equipped with full body color aerodynamics body kit, dual power front seats, full Cricket two tone leather interior, touch screen navigation with streaming bluetooth audio, 320 watt 11-speaker audio system and adaptive high intensity discharge headlamps. The vehicle was unveiled in 2009 NAIAS. It is a prototype hybrid vehicle with 2,995 cc (182.8 cu in) V6 petrol engine with a 'Twin Vortices Series' (TVS) supercharger rated 333 PS (245 kW; 328 bhp) at 5,500 rpm and 440 Nm (320 lbft) at 3,000 rpm, an electric motor rated 52 PS (38 kW; 51 bhp) and 300 Nm (220 lbft), eight-speed automatic transmission. It has combined ratings of 374 metric horsepower (275 kW; 369 bhp) and 550 Nm (410 lbft). The electric-motor is powered by 240-cell, 288 V, 6 Ah nickel metal-hydride battery array. The 4motion four-wheel drive system was replaced by a lighter Torsen centre differential from Audi Q7 to save weight. The electric motor has the top speed of 50 km/h (31 mph). Start-stop system supports regenerative braking, coasting. Power steering, air conditioning were changed to be powered by battery. Planned production version included special E-switch that the driver can activate for pure electric driving, 160 km/h (99 mph) coasting speed. US models included 3.6 V6, 4.2 V8, BlueMotion 3.0 V6 TDI. Canada models include 3.6 V6, BlueMotion 3.0 V6 TDI. BlueMotion 3.0 V6 TDI was sold as V6 TDI Clean Diesel in US and Canada. In Canada and the USA, ads showed the Touareg being capable of feats that other Volkswagen cars could not accomplish, such as going right through a snowbank while a New Beetle got stuck. A Touareg V10 TDI pulled a Boeing 747 as part of an advertising campaign, which holds the world record for the heaviest load towed by a passenger car. In 2007 día de los Inocentes, Volkswagen Spain site showed a fake Touareg Cabrio convertible. The site was registered to VW's Spanish division. As part of the Touareg 2 launch campaign coinciding with The Bourne Ultimatum movie premiere, Volkswagen launched an interactive stunt simulator that allows fans to play out their own stunts online. Users can maneuver any of six different VW models through different explosions, while altering vehicle speeds, props, sound effects and camera angles to make that perfect scene. The third generation (Typ 7P5) was revealed on February 10, 2010 in Munich, and later in 2010 Beijing International Auto Show. The new Touareg features a world first in automotive headlight technology: the "glare-free high beam". ("Dynamic Light Assist" at Volkswagen). Unlike an adaptive high beam system, the newest system continually and gradually adjusts not only the range of the high-beam, but also its pattern. The beam pattern changes its direction continually so that vehicles in front are not being illuminated, while the area surrounding them is being constantly illuminated at high beam intensity. The vehicle was unveiled in 2010 Geneva Motor Show, and later in 2010 New York International Auto Show, 2010 Guangzhou Auto Show. Chinese model went on sale in early 2011. It is a version of Touareg with seats with two-tone leather combination "Nappa" upholstery in 2 colour combinations (Pepper Beige–Titan Black, Dark Burgundy–Titan Black), heated front seats with electric 12-way settings, electro-pneumatically adjustable backrest side bolsters and head restraints with longitudinal and height adjustment; leather door inserts, a black headliner and sill panel strips in stainless steel with exclusive lettering, decorative elements made from real wood in "Olive Silk Gloss", 19-inch "Salamanca" alloy wheels in Sterling Silver (no-cost optional 19-inch Girona wheel, optional 20-inch "Tarragona" wheel), Chrome & Style package, roof rails in anodised silver. It is a race car for 2011 Dakar rally, replacing Race Touareg 2. It included 2.5-litre twin-turbocharged TDI engine rated 300 PS (221 kW; 296 hp), 5-speed sequential gearbox and a ZF-Sachs three-plate ceramic clutch, steel spaceframe chassis, BF Goodrich 235/85 R16 tyres. Race Touareg 3 Qatar is a concept car based on the Race Touareg 3, for street use. It included BBS 18-inch gold wheels, Serpentino Grey Metallic safety cage, Recaro racing bucket seats, Matt Carbon interior trim, "Black" and "Pure Grey" Nubuk leather upholstery at seat side supports and the door trim panels, Titan Black Nappa leather-upholstered centre seat panels, two-tone seams and silver piping on the seat covers and safety-related items painted in Tornado Red. Touareg Gold Edition is based on Touareg with 4.2 V8 FSI engine. It included custom designed 22-inch wheels, roof rails, protective guard strips and window frames, mirror caps and parts of the air intake frame, "Magic Morning" body colour, 24-carat gold accents and switches, "Luna" interior trim colour, Luna Alcantara roofliner and Nappa leather seats, natural brown leather dashboard with Magnolia seams, floor mats in Natural brown with leather inserts in "Luna". The vehicles were unveiled at the 2011 Qatar Motor Show. It is a limited (1000 units) version of 2014 Touareg TDI Clean Diesel Lux (240PS) with 4MOTION all-wheel-drive system for the US market, commemorating 10th anniversary of Volkswagen Touareg. It included unique 19-inch 'Moab' aluminum-alloy wheels, Moonlight Blue Pearl body colour, LED taillights, Touareg X-specific badging, Vienna leather seating surfaces in Black Anthracite, a complementing black headliner, a panoramic powered sunroof, keyless access with push-button start, bi-xenon headlights with LED Daytime Running Lights, front fog- and cornering lights, RNS 850 navigation system with an eight-inch color touchscreen, 60GB hard drive, and rearview camera; Bluetooth technology, Climatronic dual-zone air conditioning, 12-way powered and heated front seats with driver seat memory and power adjustable lumbar, a leather-wrapped multifunction steering wheel. 380 PS (279 kW; 375 hp) @? 580 Nm (428 lbft) @? United Kingdom, Eastern Europe, Australia, New Zealand, South Africa and Chile. As part of Touareg product launch in China, a 3-part, 15-minute total movie named A Journey Beyond (锐·享征程) was produced. The movie was produced by DDB Guoan, and directed by Lu Chuan. The film itself was nominated as finalist in China Longxi awards under the FILM – Craft: Best editing category. As part of National Museum of China sponsorship, Touareg Hybrid vehicles were offered as free shuttle service – named “Museum Hopping” – between the National Museum, the Palace Museum and the National Art Museum. First time be available with mobile online services: Point-of-Interest (POI) Search via Google, map display provided by Google Earth, Google Street View function and Online Traffic Information. A modified Touareg dubbed Stanley won the 2005 DARPA Grand Challenge. VW Touareg TDI entered the 85th running of the Pikes Peak International Hill Climb, with V10 TDI Touaregs and a V6 TDI Touareg, driven by Ryan Arciero, Mike Miller and Chris Blais. Arciero won the race with a time of 13:17:703 and set a new division record for the fastest time with a diesel powered vehicle. Miller finished in second with a time of 13:25:247. Chris Blais finished in third with a time of 15:48:312. The 2.5L R5 TDI won a 2007 Baja 500 class with drivers Mark Miller/Ralph Pitchford (USA/South Africa). It included a 5.5 L V12 clean diesel engine with dual Garrett TR30R turbochargers rated 550 PS (405 kW; 542 bhp) and 850 Nm (627 lbft), Xtrac six-peed sequential transmission, 9-inch rear axle, Fox Racing Shocks, KMC 17" Custom Forged Beadlock wheels with BFGoodrich Baja KRT 37x13.5x17 tires, Lowrance 9200 GPS, Sparco Carbon Fiber Racing seats. It used mid-engine, rear wheel drive layout. The chassis and body were designed by Arciero Miller Racing and Volkswagen Design Center California respectively. The vehicle was unveiled in 2008 LA Auto Show. The Race Touareg TDI Trophy Truck completed 41st Annual Tecate SCORE Baja 1000 race with 13th position for Trophy Truck Class. The vehicle was driven by Mark Miller. 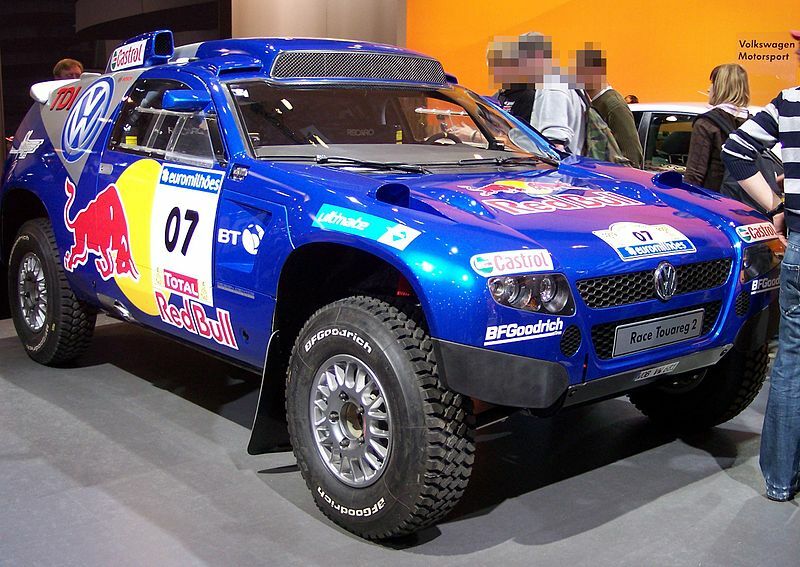 In the 2003 Dakar Rally, Volkswagen entered a team of rear wheel drive Tarek buggies. VW claimed sixth overall, driven by Stephane Henrard and co-driver Bobby Willis. In the following year, the 2004 Dakar Rally saw the debut rally for the T2 class purpose built Race Touareg by Volkswagen Motorsport. Bruno Saby and co driver Matthew Stevenson claimed sixth position overall. In the 2005 Dakar Rally, Jutta Kleinschmidt and co driver Fabrizia Pons claimed third spot overall in the Race Touareg. In the 2006 Dakar Rally, VW driver Giniel de Villiers and co driver Tina Thorner claimed second spot the highest ever for a diesel model in the new Race Touareg 2. It has a shorter wheelbase than the original Race Touareg, as well as increased visibility. For the 2007 Dakar Rally, VW driver Mark Miller and Ralph Pitchford drove the Race Touareg 2 to 4th position overall. In the 2008 Central Europe Rally, Carlos Sainz drove his Race Touareg 2 to victory. Finally, in the 2009 edition of Rally Dakar, Volkswagen achieved a one-two result. Giniel de Villiers and co driver Dirk von Zitzewitz won the race ahead of Mark Miller and Ralph Pitchford. With just two days to go, Carlos Sainz crashed out after dominating the rally for several days, thus preventing Volkswagen from making it a one-two-three result. Carlos Sainz won in 2010 with a 1-2-3 finish, and Nasser Al-Attiyah won for VW in 2011. A 1/32 slot car model of the Red Bull-sponsored Touareg, which is designed to run on the company's RAID track (which simulates off-road racing) is available from Ninco. The Touareg was Car and Driver magazine's Best Luxury SUV for 2003, Motor Trend magazine's Sport/Utility of the Year for 2004, "Four Wheeler" magazine's Four Wheeler of the Year for 2005, and Overlander's 2003 4WDOTY. Last updated on 12 September 2015 at 13:18.